We believe that modern isn't just a style—it's an approach to how you live in your home. Our 2017 collection blends the best of quality materials, pure forms and functional details to create a warm, modern space. Take a peek at some of the pieces that take modern living to the next level. Our Linear collection continues to grow. 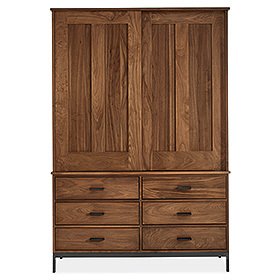 The new Linear armoire features classic design with a smart update: the top part of the cabinet detaches from the bottom, making it easy to move or fit through doorways. 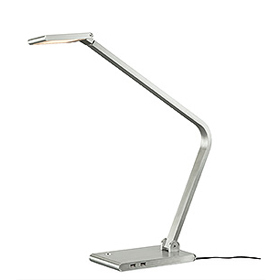 Minimalist on the outside, our new Reach LED task lamp features a carefully calibrated spring-and-pulley system on the inside which keeps the arm in place, exactly where you need it most. Reach also has two integrated USB ports so you can easily charge your devices. 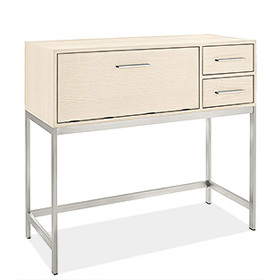 Create a modern, sit-or-stand work station with our Alden office armoire. Simply stand and use the top surface, or use the drop-down desk to sit while you work. Two drawers provide added storage.